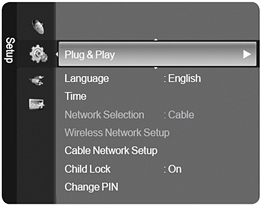 When you buy a TV or If you want to change the initial setting, You can use Plug & Play Feature to set initial setting. Please refer to the below steps. Generally, When the TV is initially powered on, basic settings proceed automatically. 1. Press the POWER button on the remote control. The message “The Menu Language, Store Demo, Channels, and Time will be set.” is displayed. 2. Press the ENTER button, and then Select “the OSD Language.” menu is automatically displayed. Press the ENTER button. 3. Select the appropriate language by pressing the ▲ or ▼ button. Press the ENTER button to confirm your choice. 4. Press the ◄ or ► button to select “Store Demo” or “Home use”, then the ENTER button. 5. Press the ENTER button. Select “the appropriate country” by pressing the ▲ or ▼ button. Press the ENTER button to confirm your choice. 6. Press the ▲ or ▼ button to select the channel source to memorize. Press the ENTER button to select “Start”. • Digital & Analogue: Digital and Analogue channels. 7. Press the ENTER button. Press the ▲ or ▼ button to select “Auto”, then Press the ENTER button. 8. The message “Enjoy your viewing” is displayed. When you have finished, press the ENTER button. If you want to reset this setting, please follow the below. 1. Press the MENU button to display the menu. Press the ▲ or ▼ button to select “Setup”, then press the ENTER button. 2. Press the ENTER button again to select “Plug & Play”. 3. Enter your 4 digit PIN number. The default PIN number of a new TV set is ‘0-0-0-0’.